Minister of Agriculture and Fisheries, Hon. Roger Clarke (2nd left), along with Member of Parliament for North East St. Elizabeth, Raymond Pryce (right), sign a contract worth $30.3 million for rehabilitation of two cane roads in the Appleton area of St. Elizabeth, while and Director, B.F. Pavements and Consultants Limited, Donovan Bryan (2nd right), scans the document. Observing the proceedings (from left) are: Permanent Secretary in the Ministry, Donovan Stanberry; Project Engineer in the Ministry, Milton Hodelin; and Head of Delegation of the European Union (EU) in Jamaica, Jesus Orus Baguena. Eight contracts totaling just over $404 million were signed on September 3, at the Ministry’s Hope Gardens headquarters, for the rehabilitation of more than 44 kilometres of cane roads across the island. Eight contracts totaling just over $404 million have been signed for the rehabilitation of more than 44 kilometres of cane roads in seven sugar-dependent communities across the island. The road works, which will be undertaken in the parishes of St. Catherine, Westmoreland, St. Thomas, Clarendon, and Trelawny, come under the Cane Roads Rehabilitation Project in the Ministry of Agriculture and Fisheries. The contracts were signed by the Minister of Agriculture and Fisheries, Hon. Roger Clarke, Members of Parliament and Councillors for the various areas, and contractors selected for the projects, during a ceremony on Tuesday, September 3, at the Ministry’s Hope Gardens offices in St. Andrew. Among the agreements signed, are two contracts with a combined value of $160.7 million for the rehabilitation of six cane roads in St. Catherine, inclusive of roadways in the Worthy Park and Bernard Lodge areas. The contracts were signed by Member of Parliament for South Central St. Catherine, Dr. Andrew Wheatley and contractor, Dwight’s Construction Limited. An agreement valued at $74.3 million was also signed between Minister without Portfolio in the Ministry of Finance and Planning and Member of Parliament for North Clarendon, Hon. Horace Dalley and Pavement and Structures Limited for the repair of roads in the parish. Also, a contract for $48.4 million was signed between Attorney General and Member of Parliament for North Trelawny, Hon. Patrick Atkinson and D.R. Foote Construction Company to rehabilitate two roads in the parish. Additionally, Councillor Devon Thomas signed a contract with N.R. Diaram Construction Company for $33.34 million, to rehabilitate two roads in Westmoreland. A second contract valued at $26.9 million was also signed with D.R. Foote Construction Company for the rehabilitation of two cane roads also in the parish. Minister of Health and Member of Parliament for Eastern St. Thomas, Hon. Dr. Fenton Ferguson also inked a contract with B.F. Pavements and Consultants Limited for the repair of two roads in the parish at a cost of $30.4 million. Also, in the Appleton area of St. Elizabeth, the government will repair two roads at a cost of $30.3 million. The contract was signed by Member of Parliament for North East St. Elizabeth, Raymond Pryce and contractor, B.F. Pavements and Consultants Limited. In his remarks, Minister Clarke said the road works will improve the efficiency of cane harvesting operations in the country’s sugar sector and reduce the significant post-harvest losses, which are estimated at three per cent of national cane production. He informed that the projects are slated for completion before December this year and urged the contractors to stick to the budget and timetable. The Minister also implored all sugar stakeholders to seize the opportunity to increase production, productivity and efficiency in the industry. Head of the Delegation of the EU in Jamaica, Jesus Orus Baguena, remarked that upgraded road infrastructure will impact positively on economic activity and reduce transportation costs. 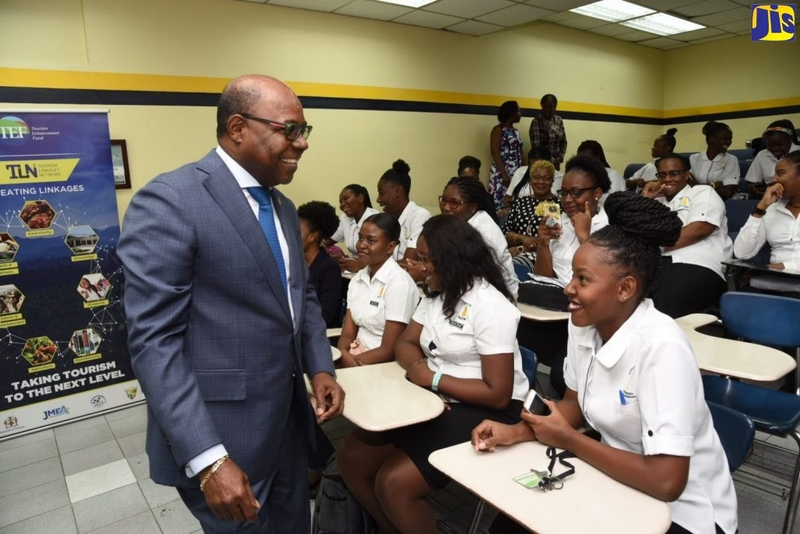 He also noted that the socio-economic benefits will not be superficial or transient, but lasting and meaningful for the small farmers in St. Thomas, the community of Long Pond in Trelawny, and the Appleton, Monymusk and Worthy Park estates. The Cane Roads Rehabilitation Project forms part of Government’s Sugar Adaptation Strategy, which is supported by the European Union’s (EU) Jamaica Accompanying Measures for Sugar (AMS) programme. It aims to improve the efficiency of the transportation of sugar cane from farm to factory.